Google is a massive brand and an extremely innovative company; they’ve expanded into countless things from internet balloons to glasses to self-driving cars. When Google decided to send out camera’s around the world to enable the use of ‘Street view’ technology, they sometimes find interesting, bizarre, shocking, and even revolting images. 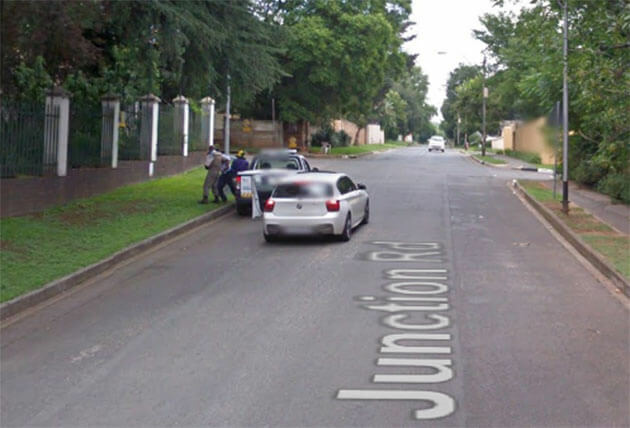 In South Africa, an armed robbery has been caught on camera by a passing Google Street View car in South Africa. Images taken along Junction Road in Johannesburg showed the attack on a security firm van in February. As the Google car approaches on the other side of the road, a white BMW can be seen pulling up behind the ADT vehicle. Two men then jump out and open the passenger door as their accomplice waits in a getaway car. As the Street View car passes, a man in a large green and yellow hat can be seen holding the driver at gunpoint as he is bundled out of the van and on to the grass verge. Seemingly either unaware or unconcerned by the mounted cameras, the robbers drag the security guard out of his vehicle and appear to search him. By the time the Google car disappears from sight at the end of the road, the robbers are driving away and their victim cannot be seen. The incident took place within viewing distance from the nearest neighborhood patrol station; unfortunately the station guard remained oblivious to the assault happening metres away. Theunis Kotze, General Manager ADT Inland Region confirmed the incident in question happened on February 2015. “It was an opportunistic crime where an ADT Reaction Officer was held at gunpoint by two criminals in Johannesburg. No one was injured in the incident. The Reaction Officer’s weapon was stolen.” According to Kotze, police and ADT investigated the incident but no arrests were made at the time. 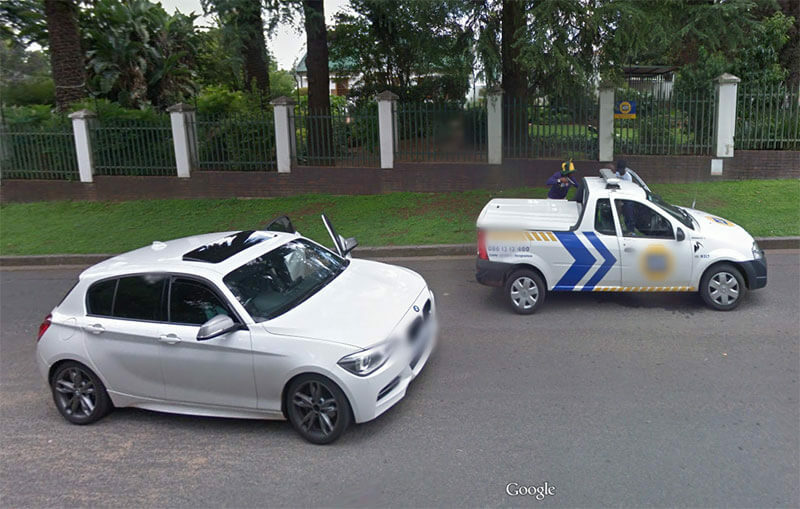 (Above) Google Street View Captures Armed Robbery. The South African Police Services (SAPS), along with ADT, investigated the incident but no arrests were made at the time. Police recorded more than 4,200 crimes in Bramley, where the hold-up took place, in 2014, including nine murders, 495 robberies and 79 carjackings. Armormax has a facility in South Africa and can prevent attacks like this from happening for more information please visit www.armormax.co.za for more information or to visit the armoring factory. 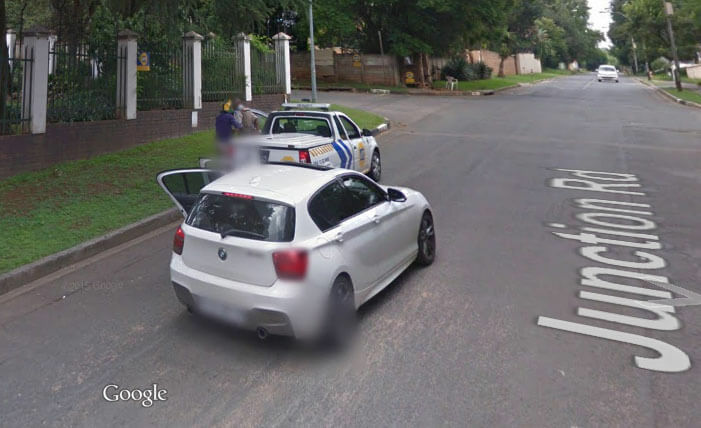 *Due to Google’s Street View policies the license plate of the robbers’ BMW and the branding of the ADT patrol vehicle have been blurred out.